Ford Fusion gives you three energy modes to choose from. You can use EV Now, which is primarily plug-in energy, or EV Later, which saves plug-in energy for later. Auto EV uses plug-in energy for the most part, tapping into the gas engine as needed. All modes get great city/highway mileage without producing harmful emissions. FordConnect creates an in-cabin Wi-Fi network. AT&T powers the network, which gets 4G LTE speeds. Connect up to 10 devices simultaneously, and enjoy a wireless range of up to 50 feet during your morning commute, weekend trips or extended journeys. 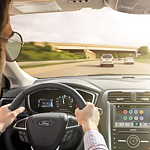 Experience FordConnect for yourself. Swing by our Ford dealership today for a test drive.